Day trips to nearby islands and party cruises, snorkeling and scuba diving are probably the most popular other-than-the-beach activities around Sihanoukville these days but there are lots of other local fun and adventure possibilities as well - ocean fishing, nature walks and river trips in Ream and Kirirom National Parks, kayaking, water skiing, jet skies, multi-day trips exploring the islands, countryside tours to little fishing villages and secluded beaches, an afternoon at the waterfall, overnighters to Bokor Hill Station, Kep, Kampot and more. Listed below are details on just a few of the possible activities. Ask the listed tour operators for more destinations and activities. Also see Kampot and Kep Points of Interest. 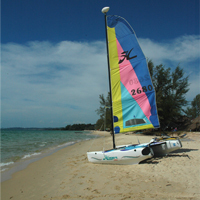 Island hopping day cruises and evening booze cruises are the most popular off-beach activities in Sihanoukville. Several kinds of package boat trips are available, the most popular being the full-day island cruise - leaving in the morning and taking in three islands for snorkeling, swimming, fishing, kayaking, seafood lunch and drink, starting around $15-$25. There are also regular booze cruises, sunset cruises and night time party cruises, similarly priced. Check with any tour operator in town for tickets. 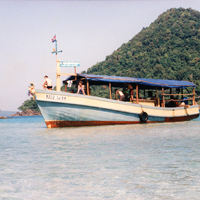 If you are interested in exploring one of the bigger islands of Koh Rong or Koh Rong Sanloem, there are several daily express ferries as well as standard slow boats from Sihanoukville. 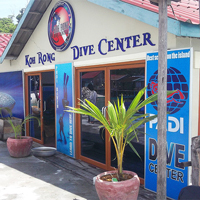 It�s easy to check out Koh Toch Beach on Koh Rong, or Saracen Bay and M�pay Bay on Koh Rong Sanloem in a day - ferry there in the morning then back in the afternoon, or stay if you like. The return tickets are open ended. For regularly scheduled ferry transport to the islands see here. Be travel smart, make sure your boat has sufficient safety equipment and is not overloaded. There are plenty of angling opportunities in the waters around the local islands. The best fishing is in the dry season (Nov-May) when the weather is fair. A variety of game species inhabit the local waters including the prized barracuda. Be smart, make sure your boat has sufficient safety equipment and is not overloaded. Boat trips, both ocean and river. Offering unique river boat and kayak trips through mangrove eco-system and Cambodian countryside. Also offering ocean fishing trips as well as on the river. Far end of Otres Beach (Otres 2). Day trips, overnights, long-stay trips to Saracen Bay, Koh Rong Sanloem Island. 3-deck yacht with bars, lounge, sundeck, dance floor and DJ, including lunch buffet, snorkeling and tubing for $25. Night party cruises with DJ, fire show, beach bar, BBQ and more. Book/depart from Ochheuteal Pier. Unique 45� racing yacht - the Cygnet - offering daytrips, overnight and weeklong charters to the outer islands. Operating professional sailing charters, offering fully crewed and catered daytrips, Sunset Cruises and even multi-day live aboard charters. Charters can accommodate up to 6 adult passengers, 3 sleeping cabins, galley. Explore the islands in style on a private sailing yacht with Captain Pierre-Yves. A gradually increasing number of places offer water sports equipment rental - jet skis, kite surfing, hobie-cats, kayaks and more. Several of the beach restaurants on Otres Beach rent kayaks..
Kite surfing off Otres Beach. Kite rental and kite surfing school on the beach. 1 hour and multi-day courses. Kite rental by the hour. At Lim Hour Bungalows on Otres Beach. Watercraft rentals from Paddle boards & kayaks to larger catamarans. Charged by the hour starting from $6.00. Staff provide training beforehand. If you prefer you can pay an extra $5.00 for a member of staff to accompany you. For those a little more adventurous boats can be rented for a day or longer should you wish you sail out to the nearby islands and spend the night. Large inflatable water park right on Otres beach. Similar to a floating assault course with various obstacles including slides, trampoline and rope swings. Should you wish you can even catapult each other into the ocean with the launch pad. Life jackets provided if needed. Prey Nup Mangrove Ecosystem Discovery is running tours to a large mangrove forest preserve at oceans edge in Prey Nup district north of Sihanouk Ville town, offering a unique look at a delicate and endangered ecosystem. Excellent bird watching opportunities. Species sighting include Painted and Milky Storks, Kingfishers, Kites and Egrets. Guided eco-tours of the forest by kayak and from an observation station. Day trips and overnight trips can be arranged. Advanced booking essential. Ream National Park, officially called Preah Sihanouk National Park, the park has become known as �Ream� because it is located in the Ream commune. The park was established in 1993, inaugurated in March 1995, and encompasses 21,000 hectares of coastal area including sandy beaches, mangrove forests, the Prek Tuk Sap estuary, off-shore coral reefs and two islands (Koh Thmei and Koh Seh). Though rarely seen the Park provides refuge for such species as macaques, sun bear, dolphins, mouse deer, pangolin, over a hundred species of birds and there is even rumored to be a tiger. The Park and tour operator out of Sihanoukville offer a number of different tours of the park including jungle trekking and river boat trips along the Prek Tuk River through the jungle and mangroves to the ocean. The river trip is the most popular tour of the Park and is also more likely to provide wildlife sightings. Most tours are less than a half-day. 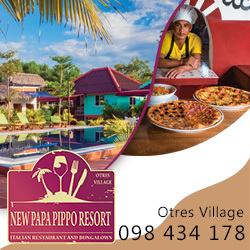 Tours may be arranged through a tour operator (see page 36) or directly through the Park at the Park Office (located 23 km north of Sihanouk Ville, 500m off Route 4 on Airport Road, opposite the entrance to the airport). The Park office is open 7 days per week 7AM to 5PM and there are usually several guides of varying linguistic skill levels on hand. Park Office phone: 012-875096, 012-215759. 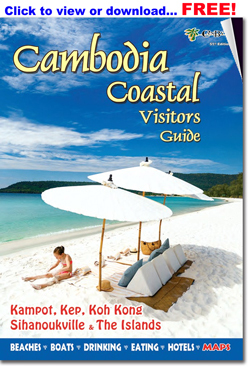 Several guesthouses in Sihanoukville as well as tour operators can arrange transportation and tours of the park. There are set programs offered by the Park though itineraries are flexible and can be tailored to individual or group needs. Prices may vary. Tours out of Kampot to the old Bokor Hill Station in the nearby Elephant Mountains have long been popular. A new casino/hotel complex has gone up over the last couple of years, and the road up the mountain greatly improved, but the remnants of the old hill station are still there - a mountaintop collection of crumbling buildings - hotel, casino, church and royal residence. The Bokor complex was originally constructed by French authorities in the early 1920s as a complement to the Kep resort area. In its day Bokor was an elegant getaway for officials and foreign visitors - a classic colonial 'hill station' located in the mountains to allow foreigner visitors accustomed to more temperate climes to escape the tropical heat. The old building were abandoned to war in the 1970s, leaving ghostly ruins - vestiges of a different age, often shrouded in fog and clouds. 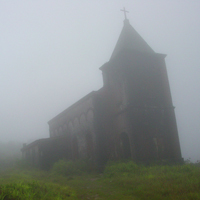 Full day Bokor tours can be arranged through a local tour operator. Tours start at about $10/person inclusive for an all-day tour. Some tour operators offer variations on the usual tour to include such things as trekking, cycling, motorcycling, a boat cruise. 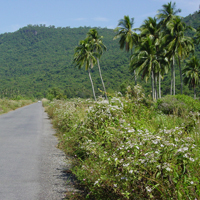 The Park Office and turn-off to the Hill Station are 37km west of Kampot on National Route 3. The drive from the base to the top takes 30-45 minutes. See Kampot page for more. In addition to the tour operators and dive shops, most of the hotels and guesthouses in Sihanoukville and even several of the restaurants and bars (especially the beach bars) arrange boat trips and island picnics, trips to the waterfalls, the national parks and Bokor Hill Station. Bear in mind that different operators offer different levels of expertise, types of boats, quality of equipment and service, etc. Shop around for the tour operator that best fits your requirements. 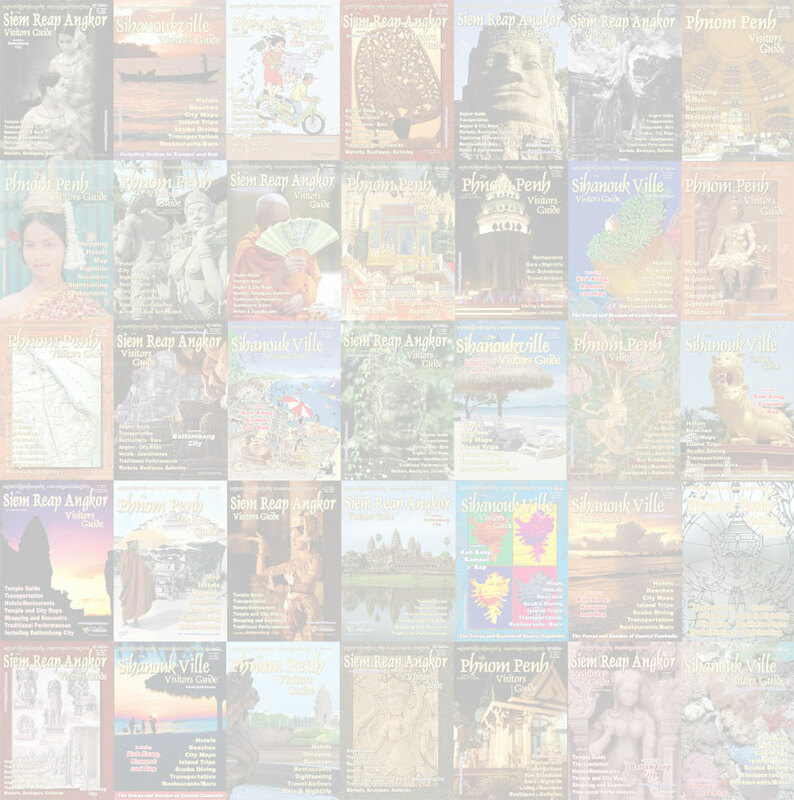 See Sihanoukville Travel and Tour Operations for a complete list.